You may be thinking that it is very early to start thinking about buying school uniform and worried that your child may grow over the summer BUT on all purchases made within this promotional period, all items can be swapped before the pupil starts school whilst retaining your 10% discount! On production of the voucher, customers will be able to receive 10% off of all of their schoolwear items purchased between Friday 5th and Saturday 20th June 2015! This provides parents with a great incentive to purchase their uniform in June, whilst allowing ample time to exchange any items that the child may have outgrown over the summer. Important: Please note that this offer is only available in store and that you must bring along a printed/physical copy of the voucher to hand in to us at time of purchase. 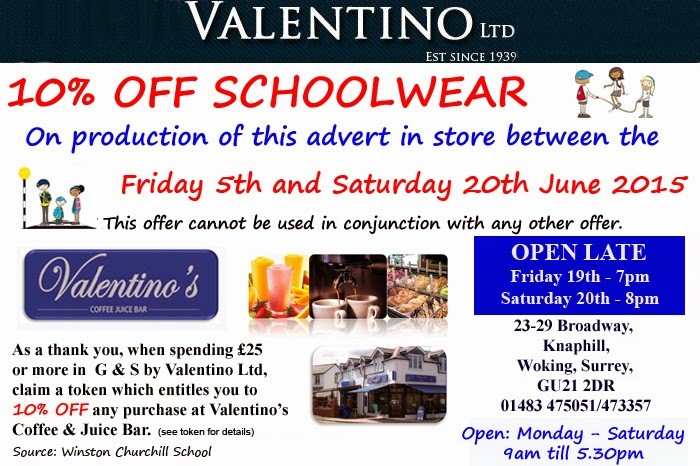 Vouchers will also be available to print off from our website www.valentinoschoolwear.com closer to the time. * Exchanges of sizing can be made at any point before the start of school in September as long as each item is kept in the same condition as it was purchased in as well as returned with original receipt of purchase showing the 10% discount originally obtained.